How many of you have been contemplating your next fax machine purchase? Unless I’m gravely mistaken, few of you get excited over the prospect of purchasing one. It’s really sad that they are still so widely used; one would think that we would have figured out a better way to transmit documents by now. The good news is that thanks to NEC, you can actually fax documents directly to someone’s cell phone. 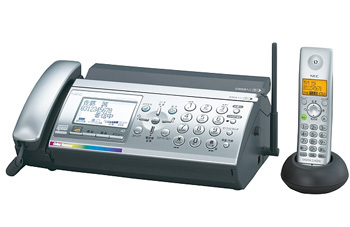 The SP-NA640 from NEC doesn’t actually fax documents to cell phones per se, but rather scans them and sends the document out via email. There’s no information on how it will be displayed on one’s cell phone, so don’t expect everyone to be able to read it. I have to give NEC some credit, this is probably the most interesting feature that I’ve seen on a fax machine in some time. There’s no word on pricing, however, from what I can tell it appears to only be available in Japan at this time.